If you wanted to get into classic car motoring for $6,000 or less, what would you buy? 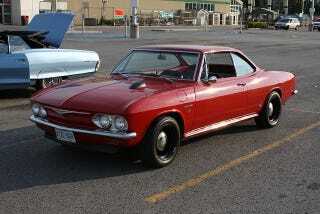 I'm looking into getting a Corvair Corsa sometime when my wife and I both nail down decent jobs (she may have hers very soon), but what are other options? Restrictions: pre-1975, preferably American, preferably able to achieve 20 mpg. Those are just my restrictions though. If you have better ideas, go ahead and put 'em up!